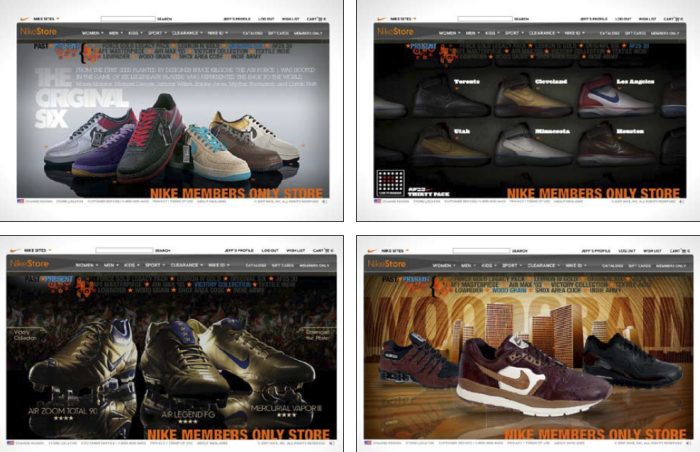 Nikestore.com - Nike+ - Introducing the Nikeplus.com experience. 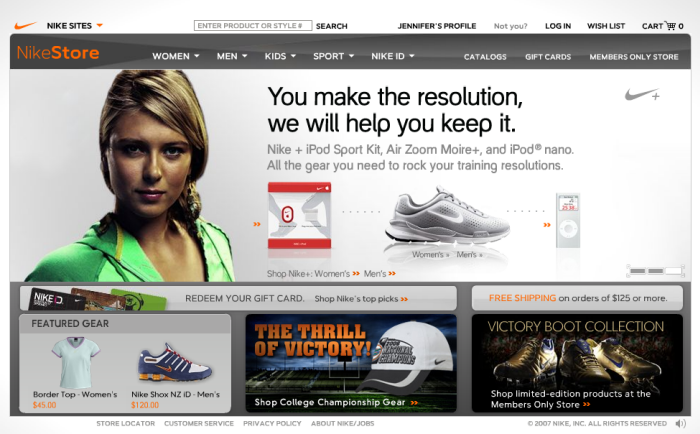 This section within Nikestore.com featured an overview section, a How Nike+ works section and led users to view both Men's and Women's Nike+ products. 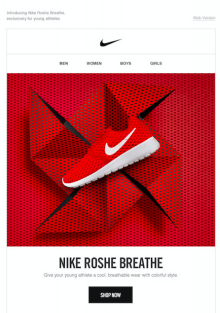 A link to nikeplus.com was also present. 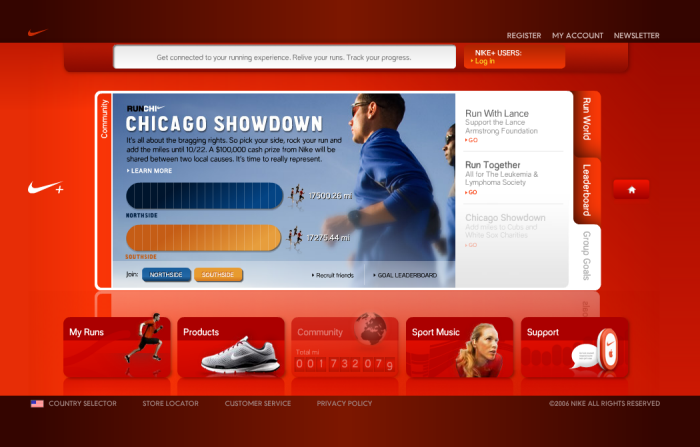 Nikestore.com - Nike+ - This updated Nike+ section on Nikestore.com showcased current running events (in this case it was the Nike Women's Marathon, the Run With Lance event and the Chicago Showdown) and featured the following sections: A Community where runners could connect to inspire, encourage and challenge each other. 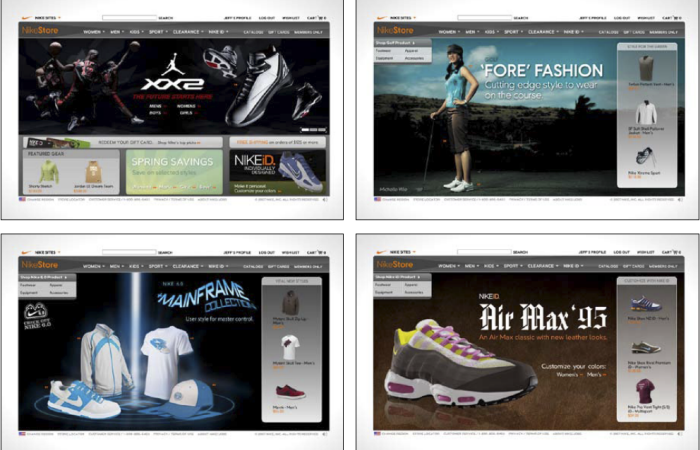 Runners could also track there runs, find product, get playlists and find product support. 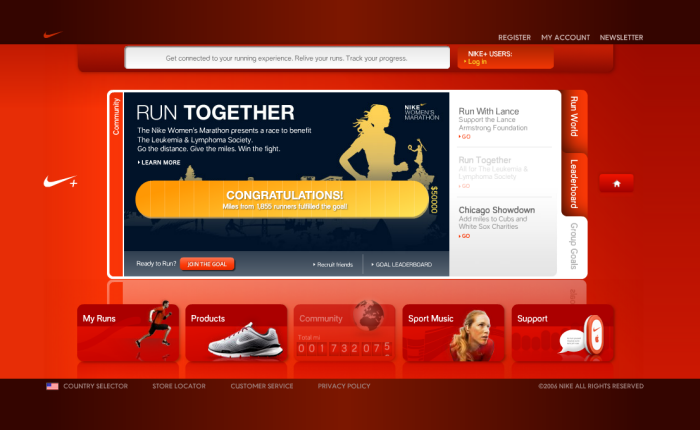 Nikestore.com- Nike+ - This updated Nike+ section on Nikestore.com showcased current running events (in this case it was the Nike Women's Marathon, the Run With Lance event and the Chicago Showdown) and featured the following sections: A Community where runners could connect to inspire, encourage and challenge each other. 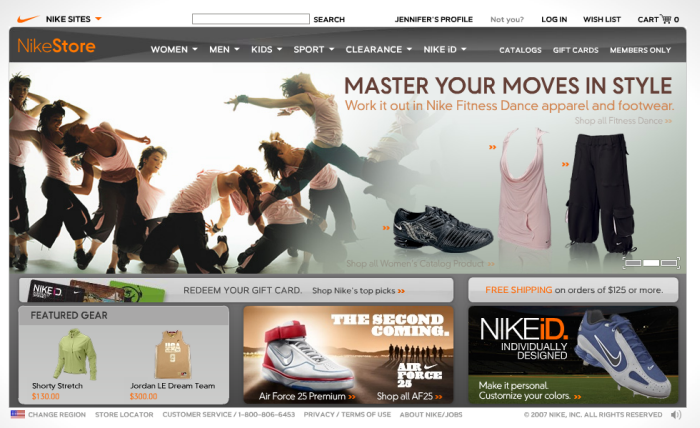 Runners could also track there runs, find product, get playlists and find product support. 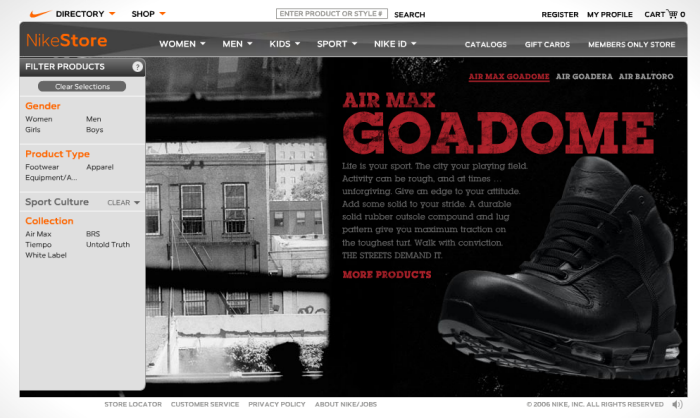 Nikestore.com - Product copy - A new Sport Culture line geared toward the urban dweller was released on Nikestore.com. 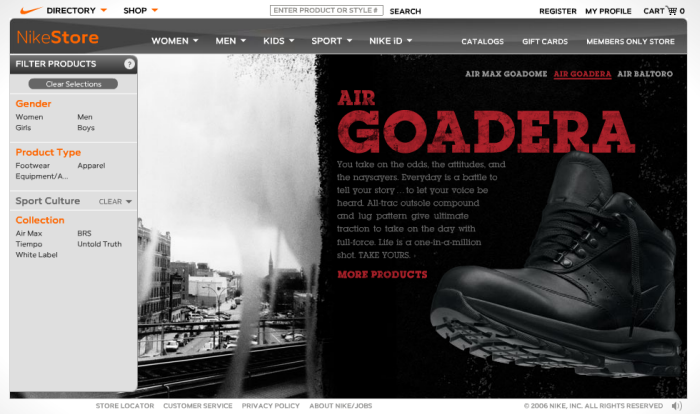 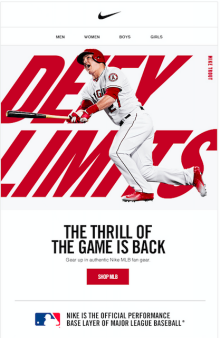 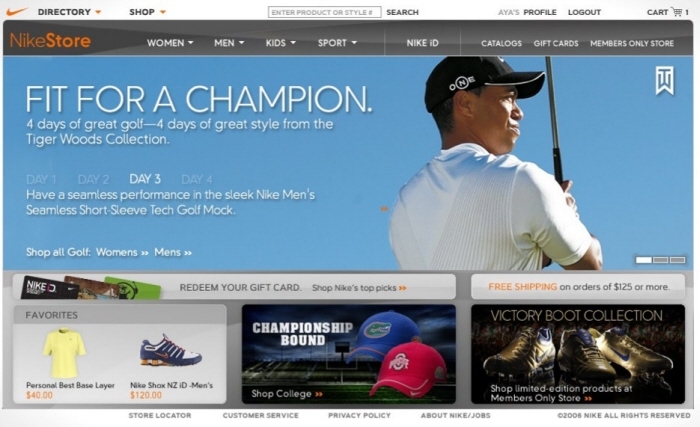 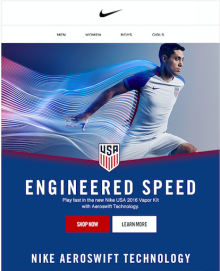 A viral video (showcased on Nike.com) also accompanied this special product push. 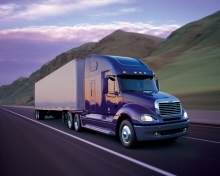 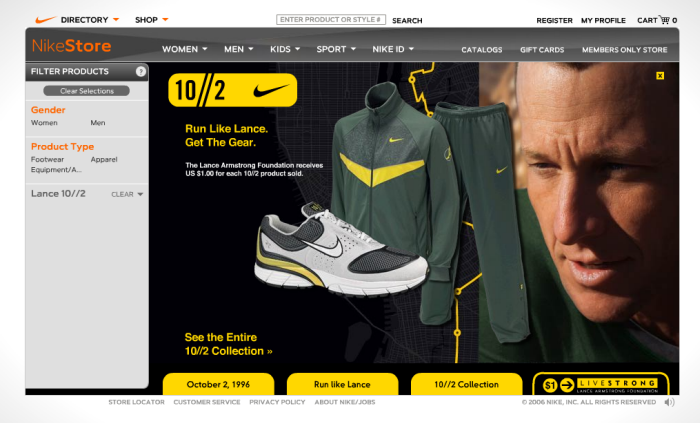 Nike.com and Nikestore.com - 10//2 - Every Day Is The Day was a campaign for the Lance Armstrong line 10//2. 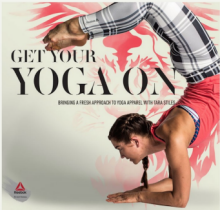 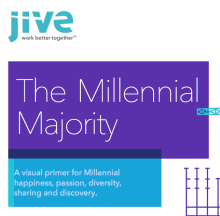 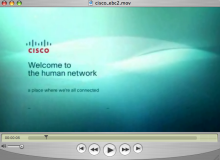 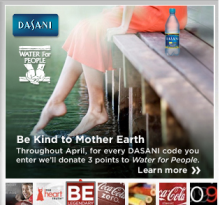 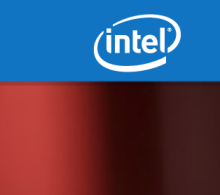 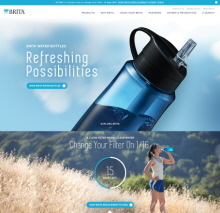 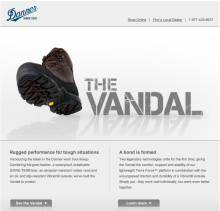 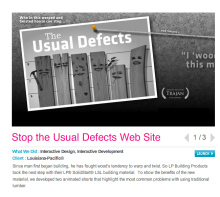 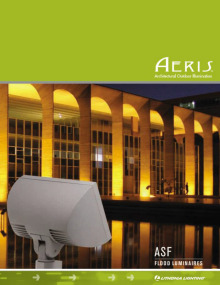 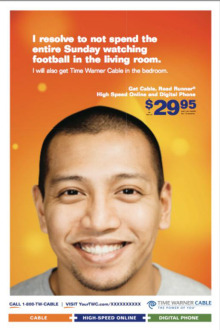 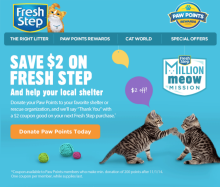 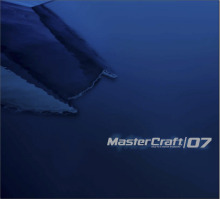 The campaign included motion pieces (as seen above) as well as email and storefront creative. 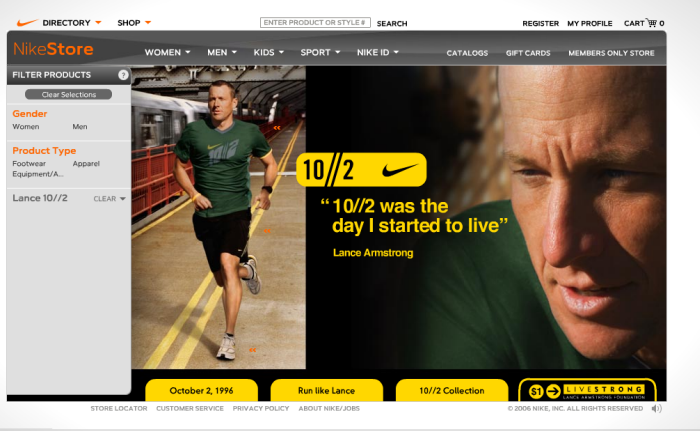 Nikestore.com - 10//2 Homepage - The 10//2 section on Nikestore.com featured an introduction (video and copy) that told the tale of what 10//2 means to Lance and why it's important for everyone to live each day like it was 10//2. 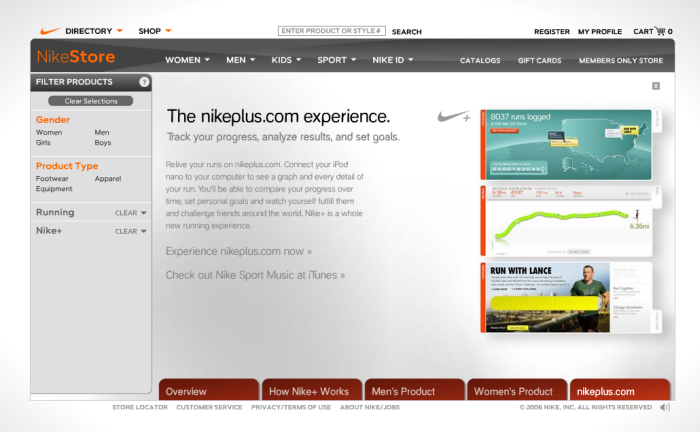 The section also led users to the special Nike+ section to take the challenge to Run Like Lance. 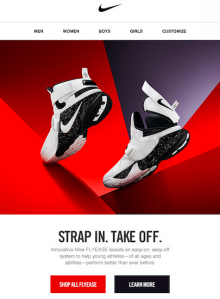 Users were also able to view and purchase items from the 10//2 collection (with a portion of the proceeds going to the Lance Armstrong Foundation). 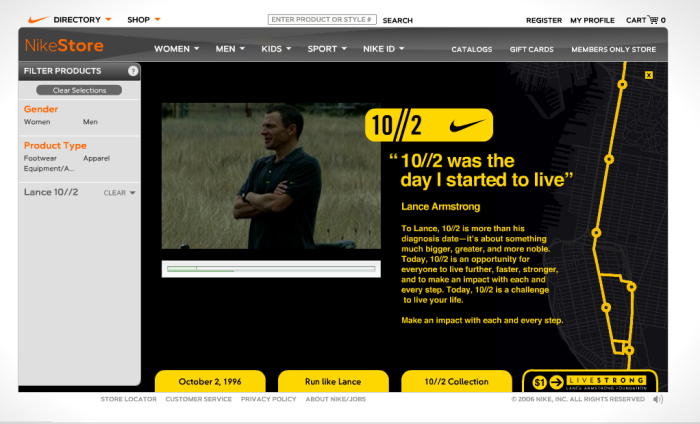 Nikestore.com - 10//2 - The 10//2 section on Nikestore.com featured an introduction (video and copy) that told the tale of what 10//2 means to Lance and why it's important for everyone to live each day like it was 10//2. 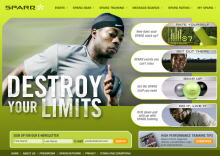 The section also led users to the special Nike+ section to take the challenge to Run Like Lance. 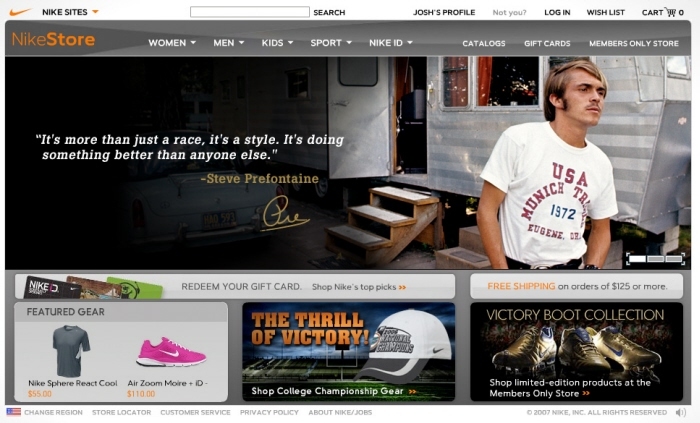 Users were also able to view and purchase items from the 10//2 collection (with a portion of the proceeds going to the Lance Armstrong Foundation). 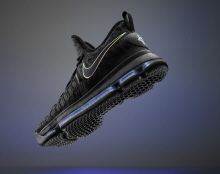 Nikestore.com - 10//2 Collection - The 10//2 section on Nikestore.com featured an introduction (video and copy) that told the tale of what 10//2 means to Lance and why it's important for everyone to live each day like it was 10//2. 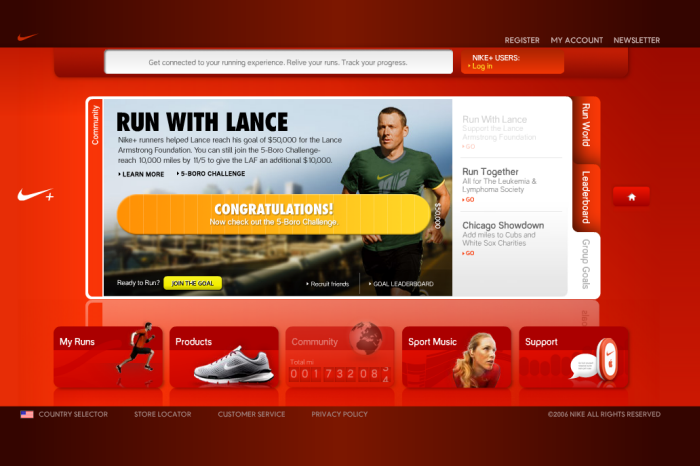 The section also led users to the special Nike+ section to take the challenge to Run Like Lance. 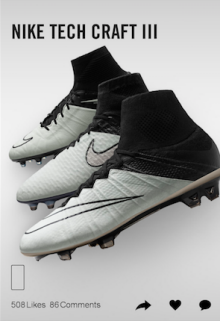 Users were also able to view and purchase items from the 10//2 collection (with a portion of the proceeds going to the Lance Armstrong Foundation). 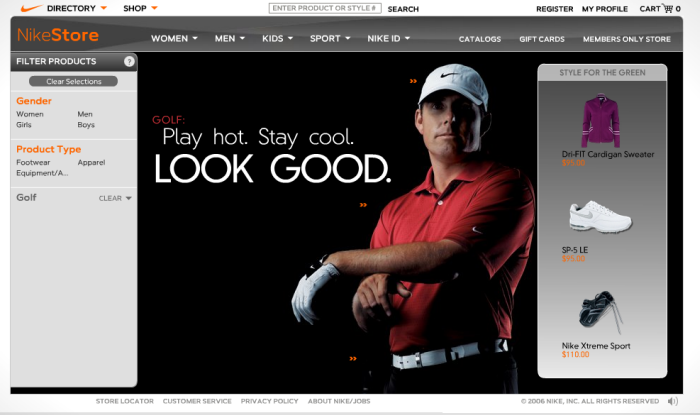 Tiger Woods Storefront - Flash animated storefront for Nike Golf featuring the New Tiger Woods Collection.